IKH-Series plugs have a thread reach 7.5mm longer than the IK-Series plugs. 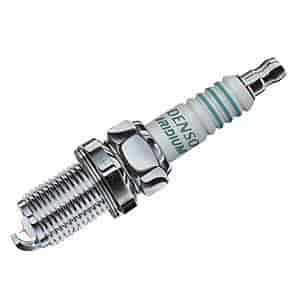 The fundamental design of this new generation of Denso Iridium Power spark plugs retains the proven features used in Denso's OE products and combines a revolutionary Iridium alloy with laser welding technology that allows Denso to harness the power of Iridium. Using Iridium, which is six times harder and eight times stronger than platinum, the tip can be shrunk to only 0.4mm. This means the voltage requirements are decreased while firing performance is greatly improved. A U-Groove has been cut inside the ground electrode to maintain the large volume of space required to form the nucleus of a flame. While still keeping the required voltage low, this powerful technology enables excellent firing performance without increasing the spark gap. The tip of the ground electrode has been cut to form a taper. This greatly improves firing performance by reducing quenching. The extreme hardness and high melting point of Iridium prevented the use of this incredible metal until Denso perfected the Laser Welding Process, which provides a 360° seal so reliable the electrode resists wear even in the harshest conditions. Does Denso 5343 fit your vehicle?